Before their winter break, a group of students from Edward R. Murrow High School in Brooklyn visited the New York Public Library to see the Library's exhibition Candide at 250: Scandal and Success, an exhibit that traces the history of Voltaire's classic tale of travel and misadventure. While they were there they also got a lesson from the Library's mapper extraordinaire, Matt Knutzen, on how to map out their own version of Candide's journey in Google Earth and Maps. Their work is now available on the Library's new website, and visitors are invited to add their own journeys to the map. 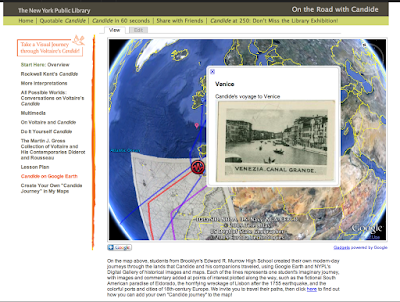 We're always on the lookout for innovative ways that students and educators are working with Google's geo tools, so we were happy to find out that the Library has also made the lesson plan available to the public. Teachers looking for a new way to teach the classics should take a look and get some fresh ideas. Take it from sophomore Anna Sherman, age 15. She had to re-read the book carefully while creating her map, so that she could plot every city right. "To make it accurate, I had to really learn about the geography," she said. "This is the direction education is heading, definitely, 100 percent. It's a new way to learn. Me personally, at my age, I wouldn’t really want to read a paper with just words on it. If you have images and video, that's so much better. It helps you see the book in a whole new light."